I discovered Gene Wolfe back in 2005 at a Borders Books my wife and I frequented. I was in my early twenties, had begun shedding my conservative upbringing, and was just looking for something new and interesting to read. I knew I had missed a lot of great books growing up and I was determined to sift through it all and find a gem to take home. What I found was Gene Wolfe’s epic, high fantasy novel The Knight. I didn’t know a lot of authors back then but I knew who Neil Gaiman was and he had a nice big quote on the back of the book praising Wolfe’s writing style. I bought it. I don’t remember the order in which I read them all. I believe The Book of the Long Sun and Latro in the Mist were my next ventures into Wolfe’s catalog because they were all quickly available at my local bookstore. At the time, I admit, I was reading a lot more than I was comprehending. I studied art and only a smattering of literature and philosophy at a little college in the midwest and I knew I wasn’t digesting everything Wolfe was putting down on the page, but I didn’t care. This wasn’t like anything else I had ever read. Most stories, whether they be in a book or a film on the screen, quickly become predictable to me. I easily pick up on tropes and cliches and grow bored much faster than most people. But this Gene Wolfe guy could always keep me guessing and always keep me trying to figure out where he was going and what he was going to do or say next. To this day I’ve not found anyone as unpredictable or as re-readable as Gene Wolfe. I was officially a fan. I started amassing a collection of his work and took to the internet to learn more. The Gene Wolfe fan base was definitely out there in 2007 but their voices weren’t nearly as loud. The Urth mailing list was the most established group of fans I could find followed by the Ultan’s Library website. Other than those two sources information was rather sparse and to be honest I felt quite intimidated by the intellectual prowess of people I saw communing there. I knew I was a fan but I was nowhere near on the same level as my fellow readers. I didn’t quite know where a person like myself would go to just find news and articles on Gene Wolfe, so I just started my own blog. Hoof&Hide was named after Horn’s children from The Book of the Short Sun and it was just a blog where I could collect and post about all of the sources I found concerning Wolfe. Articles, interviews and book covers became my little niche, and years later when I found a link back to me on the Ultan’s Library site I knew I had been accepted into the fold. It was early in 2010 when I suddenly had the thought that if I ever wanted to meet my favorite author it was now or never. I couldn’t have been more right. I started looking for cons that Wolfe would be appearing at, and by then it was quite limited because he only attended ones near to his home in Illinois. still, I managed to find the perfect one in Madison Wisconsin aptly called MadCon. It would be close, it would be small, and there would be some other interesting guests there including a new and upcoming author named Patrick Rothfuss and some dude called Harlen Ellison. I was clueless, but I headed up there with my brother (who was one of many I had converted into a fellow Wolfe fan) with the goal of meeting the man himself. We arrived at the hotel where the convention would be held and where we’d be staying to find the convention director and portion of the guests huddled in the middle of the lobby consulting with each other about the day’s events and just gabbing with each other in general. We had only been at the concierge trying to check in for a few minutes before Gene and Rosemary arrived. We knew they had because Harlen Ellison had quite abruptly emerged from the huddled group of people, interrupted our check-in process, and began demanding that the concierge assist Mr. and Mrs. Wolfe with their luggage immediately. Harlen apologized for interrupting us but my brother and I encouraged him to “please continue.” The convention hadn’t started but the show had definitely begun. It was a good sign of things to come. MadCon was definitely a success for us. We were able to meet Patrick Rothfuss, make some friends, learn first-hand who Harlen Ellison was and of course, meet Gene Wolfe. We listened to him read the first chapter of his unreleased novel, The Land Across as well as speak in some great writing panels. He signed my copy of The Sorcerer’s House (which had only just come out) and was genuinely touched when I told him how much I had enjoyed it. Sunday morning, the final day of the convention, came quickly. We were scheduled to attend a few more sessions then head home. My brother and I wandered down into the hotel lobby looking for coffee and saw Gene and Rosemary sitting by themselves at a table enjoying their own cups. I don’t possess the personality to do what I did that day. Normally, I just leave people to their own business. Perhaps, having my brother there with me helped, but we picked up our own coffee and sat down with them to chat. Most of that encounter is a blur now but we spoke about a number of things including his time in New Zealand and some Australian history (a favorite subject of mine). He also spoke about the first time he read The Island of Doctor Moreau. Two things still stand out to me from that conversation with him. The first is that Gene Wolfe and his wife definitely appreciated their fanbase. They were kind and generous people who clearly enjoyed a good conversation and if you were willing to listen, Gene was willing to fill your ears with a lot of interesting stuff. The second thing is what he told me about his experience with The Island of Doctor Moreau. He told me that he read it through once then immediately opened back up and read it again. It seems simple but it was some insight into why Wolfe wrote the way he did. He enjoyed encountering a book more than once and discovering new things while rereading it. He poured what he enjoyed about reading into his own work and that was the passion that I had latched onto and enjoyed so much when I read his books. All I can say is I feel very lucky for having been able to meet and chat with him and his wife. It was a fantastic experience. Over the last eight or nine years, I’ve posted less and less to Hoof&Hide, as I’ve watched the online fanbase community share and grow. It’s been great to see more and more people emerge from the woodwork to discuss and produce their own content around Gene Wolfe and his work. I knew back in 2007 when I started this blog that I’d very likely be around to see Wolfe move on to his next great adventure but I admit I still wasn’t quite prepared for the news of his departure. My wife texted me while I was at work and I spent the next five hours in meetings while trying to sneak quick peeks at Twitter to see what everyone was saying about him. I managed a few retweets and to post my favorite Wolfe quote, but it wasn’t until this morning that I found the time to put my own thoughts down. I owe Gene Wolfe a lot for always challenging me as a reader and inspiring me as a writer. I’m definitely thankful for the chance I had to meet and talk with him and for being a small part of the community that has sprung up around his work. And while it’s certainly sad that we will never see a new book with his name grace the shelves of our local bookstore again, what he left us is still so profoundly deep and rich that it will never fade and will always give us something new to discover within its pages. I was just checking Audible and discovered they finally have an audio version of The Urth of the New Sun finally available for purchase. Narrated by Jonathan Davis, the same reader of The Book of the New Sun series, I expect this to be equally as amazing as the first four installments. I can only hope we’ll start seeing more of the Urth Cycle get audio versions in the near future. 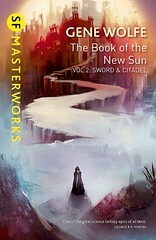 If you haven’t yet heard, the guys at Alzabo Soup are pointing the attention of their podcast at Gene Wolfe’s The Book of The New Sun. It sounds like they’ve put a lot of work into planning this one and it’s quite exciting to see it come to fruition for them. I’ll be tuning in for sure as their dive into other books have been both insightful and entertaining.